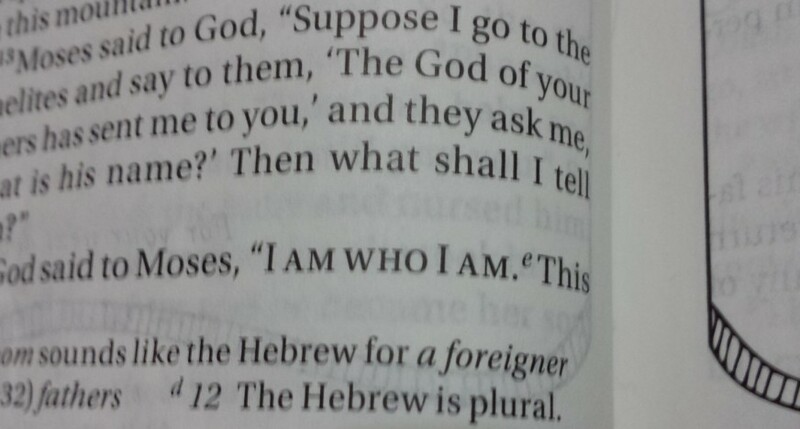 The Israelites only have one God so I wondered why he asked what name to tell them. 3. (13-14) The revelation of God’s name to Moses. a. And they say to me, “What is His name?” what shall I say to them?Rightfully, Moses sensed he needed credentials before the people of Israel. Before, he thought he had the credentials because he was a prince of Egypt. 40 years of tending sheep took away his sense of self-reliance. i. When God revealed Himself to man in the days of the patriarchs it was often associated with a newly revealed name or title for God. – Jacob met El Elohe Israel (Genesis 33:20) and El Bethel(Genesis 35:7). I never realized that God revealed himself in a new way to the patriarchs using a new name. No wonder Moses had so much doubt going back to the Israelites. I always wondered why he kept asking for sign after sign or endless reassurance. If everyone else was given an unknown revelation and I am given “I AM” the huge task ahead would feel a bit daunting. Moses would really have to rest in faith that God has already done so much for His people and will continue to do the same going forward. When I was in middle school, the Lord healed me of scoliosis. He asked me do you think I will heal you? I said of course I think you can heal me. He said that was not what he had asked. I knew then that my faith was being tested. He was asking me if I thought he would heal me right then and there not down the road. I took a step back in my mind. I thought if I say yes and it doesn’t happen, wouldn’t that send my faith into a tailspin or doubt weather God was really speaking to me at the very least? I did say yes and I did believe. I felt nothing happen. I got in the car that night and felt doubt creeping into my mind and I felt I needed to say I was healed in faith out loud so I told my mom that the Lord healed me. She checked my back at home and exclaimed it was straight! I remember thinking, I know and at that point not really needing the proof. She took me to the doctor and had it confirmed. I went from almost needing a brace to a completely straight back. The muscles on one side are still a bit raised from the other side, but I think this is just a great remnant to remember His healing. I write this because when I get some sort of medical scare I know He is with me, however, I still battle the mental doubts. I suppose I relate to Moses’ need for reassurance and then I feel so bad for needing it considering all that God has done already. May God increase my faith and help me to war off my doubts.